When the Maryland legislature first added mutual consent as a grounds for divorce in October 2015, the new law allowed couples with no children to get an uncontested divorce without having to be separated for 12 months first. Couples with minor children, on the other hand, even those who had reached an agreement on everything, still had to live apart for a year before filing for divorce, or instead file for divorce under one of the state’s more complicated fault grounds. However, Maryland lawmakers have finally fixed what was wrong with their now three-year-old mutual consent grounds, easing the burden on divorcing couples with minor children. Under the new law, couples who have minor children together can now get a no-fault divorce without first having to live apart for a year. Satisfying the mutual consent requirement only requires that the parties both agree to the divorce and have signed a written agreement resolving all issues concerning property, debts, support and child custody. This means less waiting to finalize a divorce. It also means that couples can live together while they get divorced if they want. While many people prefer a clean break and want to begin living apart from their spouses as quickly after deciding the marriage their marriages are over, others want to keep living together, at least temporarily. It may take a month or two to find housing once the decision to split is made. Additionally, maintaining two households significantly increases expenses without any corresponding increase in income, so depending on the couple's financial circumstances, it may simply not be possible for one spouse to move out right away. Even when money is not an issue, couples who are fairly amicable may keep living under the same roof to reduce the immediate shock of the divorce on their children. Another improvement with the new law is that only the spouse who files for divorce needs to go to court to get it finalized. Under the original mutual consent law, both spouses were required to attend the divorce hearing. This may not seem like a significant improvement, but often the non-filing spouse wants to play as small a role in the divorce as possible, and that includes not having to go to court. It is also helpful in situations where the other spouse is in full agreement, but lives in another state or a foreign country, making it a hardship to attend the divorce hearing. When the divorce is truly uncontested, mutual consent grounds will be the popular choice even if the couple already qualifies to use the 12-month separation grounds. That being said, filing under the one-year separation grounds may provide an advantage over mutual consent for couples who have overestimated their ability to agree. Sometimes couples think they will be able to reach an agreement on everything, but when it comes time to sign the paperwork, they discover there are still unresolved issues. If this happens, the mutual consent grounds cannot be used because it requires the parties to have a written agreement already signed at the time the divorce is filed. Unlike with mutual conent, if the couple files under the 12-month separation grounds and either spouse refuses to sign a written agreement that resolves all of their issues, the divorce petition doesn’t need to be amended to change the grounds before the divorce can be finalized. 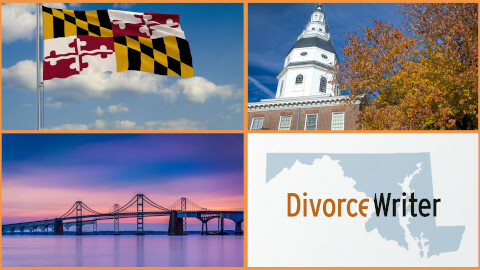 If you’re filing for divorce in Maryland and want to represent yourself, DivorceWriter provides you with the tools to get divorced on your own, without a lawyer. DivorceWriter also offers both no-fault divorce grounds (mutual consent and 12-month separation) as well as all available fault grounds (adultery, desertion, cruelty, 12-month criminal conviction, and 3-years insanity).